Players spend years mastering their Scrabble skills in order to compete in the World Championship, whether it's memorizing the lengthy Collins Scrabble Words list or copying the dictionary into their brain, page by page with their photographic memories. 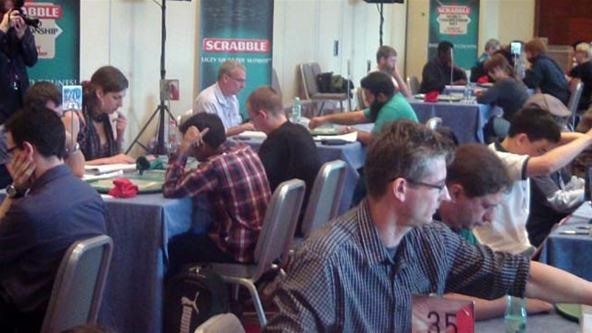 "This game is not about words," stated Brett Smitheram from England, who finished in sixth place. "The vast majority of the top players are mathematicians or computer programmers. This game is about the probability that a set of symbols will come together in such a way that you can play them on the board." Smitheran playing a winning game against Bradley Whitmarsh in the second round. 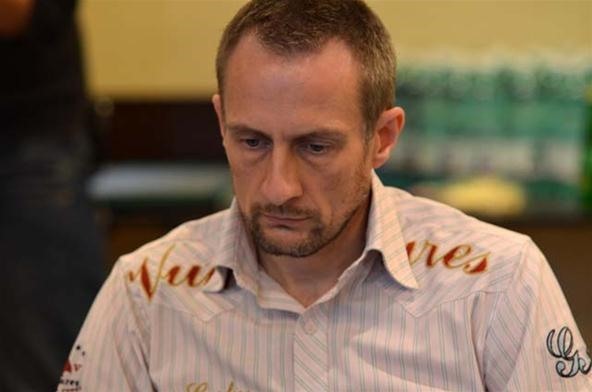 After 4 days, 34 rounds and 1,796 games, the final battle between New Zealander Nigel Richards and Australian Andrew Fisher took place on Sunday in the last five games of the competition. Andrew won two games, but Nigel ultimately prevailed, becoming the first ever two-time World Scrabble Champion. His last win was in 2007 when he beat Malaysia's Ganesh Asirvatham (absent this year). He was also runner up in 2009, losing to Pakorn Nemitrmansuk, who finished third this year and led the pack for Highest Average Score (466.29) and Highest Total Score (15,854). Richards in the third game of the finals, which he won. Nigel's final record was 25-9 with a spread of +2008. 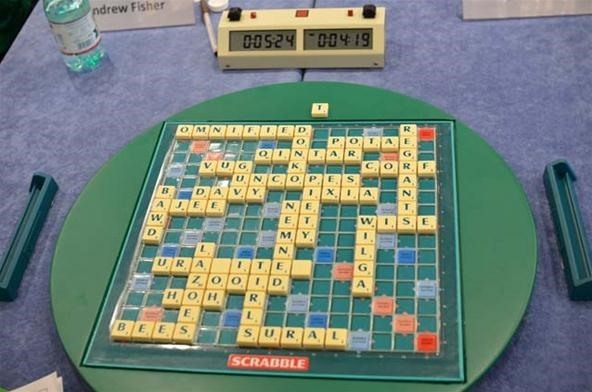 In the last game against Fisher, he secured his win by playing OMNIFIED for 95 points. Other bingos played were REGRANTS and URANITES, also by Richards. During his crowning, Richards set aside his lexical Scrabble mastery to describe his win in just one monosyllabic word—"Nice." The winning board: Nigel Richards 476, Andrew Fisher 333. 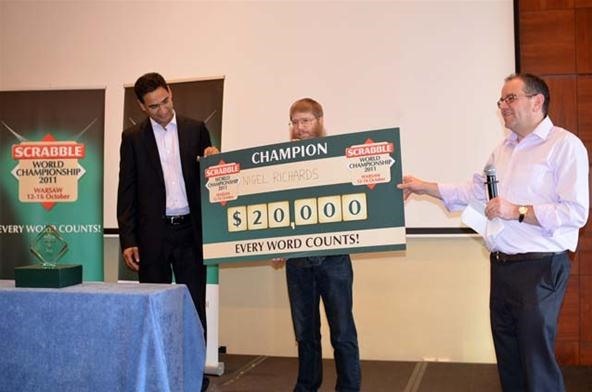 Now a two-time World Champion, Richards is also a three-time National Scrabble Champion and nine-time Singapore Open Scrabble Champion. Richards with his $20,000 winnings. It was Fisher's first time finishing in the top four. 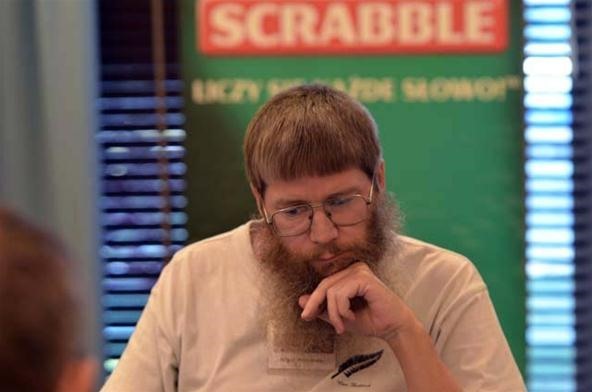 Had he won, he would have been the first Aussie to claim the title of World Scrabble Champion. But a $10,000 second place prize is sure to keep him satisfied until the next competition. Fisher in the third game of the finals. 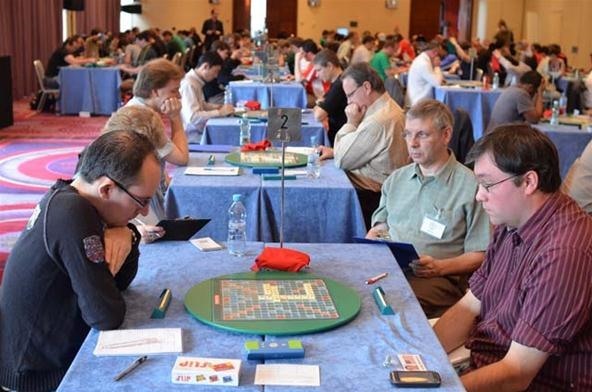 To find out more, including player statistics, recorded games, photos and game commentary, visit the official website for the 2011 World Scrabble Championship.